Creativity is an important component of strategic thinking. Those who are able to imagine and think through varying scenarios are capable of predicting the end game. Research by Larson and Angus helps shed light on the process of creative learning and its association with developing critical strategies (2011). This learning can start in high school and move into the early college years. Creative learning may continue through one’s lifetime. The development of agency is an important tool for achieving goals and ensuring the ability to move through a changing environment. Projects in young adulthood and early college can help to develop the mental faculty of seeing projects to their completion as well as thinking creatively about solving problems. Education should have a level of creative faculty to develop these skills to match concrete content learning. Agency skills also develop the ability to have executive control over one’s own thoughts, learn new cognitive tools, develop creative problem solving, learn the action skills to achieve goals and move into higher order thinking. These skills and abilities further create a platform for strategic thinking. Without the ability to think creatively, it is doubtful that new methods and paths will be found. Programs often use the “arc of work” approach which includes the concepts of planning, monitoring, adjusting existing plans and receiving feedback. When projects span of a period of weeks and months it requires students to be reflective of their creative process. When the situation changes the students can find ways of adapting to those changes. It is this thinking about and reflection on methods that helps students find new ways to complete their projects in meaningful ways. When people are engaged in projects and own the results they invest themselves into the process more deeply. It is an investment that helps create higher order thinking and strategic planning. The creation of a long-term project helps to connect the many different work methods and strategies students use to navigate their environment. It helps solidify successful methods from unsuccessful ones. They are likely to use these later in their working life. The researchers used 11 different programs to assess the results of subject creative process. They worked back into the creative process and conducted in-depth research to assess how such projects foster creative strategic thinking. A few years later, they interviewed the participants again to create a longitudinal approach. They looked at artistic programs, social activism, media arts, political action, and leadership programs. An in-depth review of plans, thought processes, and perceptions were particularly important. The participants reported that they learned how to mobilize their efforts and regulate their time. They gained the long-term perspective that allowed them to create strategies to complete their projects. Their plans were broken down into action steps. Steps are seen as sequential actions that lead to project completion. Most remarkably, participants learned that strategic thinking requires the ability to adjust with changing circumstances, understand how others respond, and think through the alternatives, and have backup plans. They were able to think through how human systems operate and what cognitive models others use to respond to their various actions. Most importantly, they were able to transfer the skills learned to other areas in life including prediction of events and determining alternative actions. The report connects the concepts of creative thinking and analytic analysis to determine the potential scenarios. 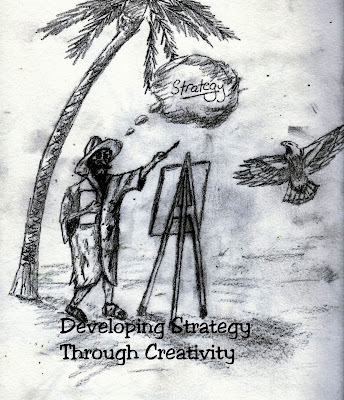 The authors come to a definition of strategic thinking as ‘Use of advanced executive skills to anticipate possible scenarios in the steps to achieving goals and to formulate flexible courses of action that take these possibilities into account.’’ Strategy is a process of first envisioning the possibilities and then systematically thinking through the likely outcomes of results. It is both a freethinking and analytical process where possibilities are explored and the most likely ones chosen. When the environment changes, so does the strategies. Larson, R. & Angus, R. (2011). Adolescents’ development of skills for agency in youth programs: learning to think strategically. Child Development, 82 (1).